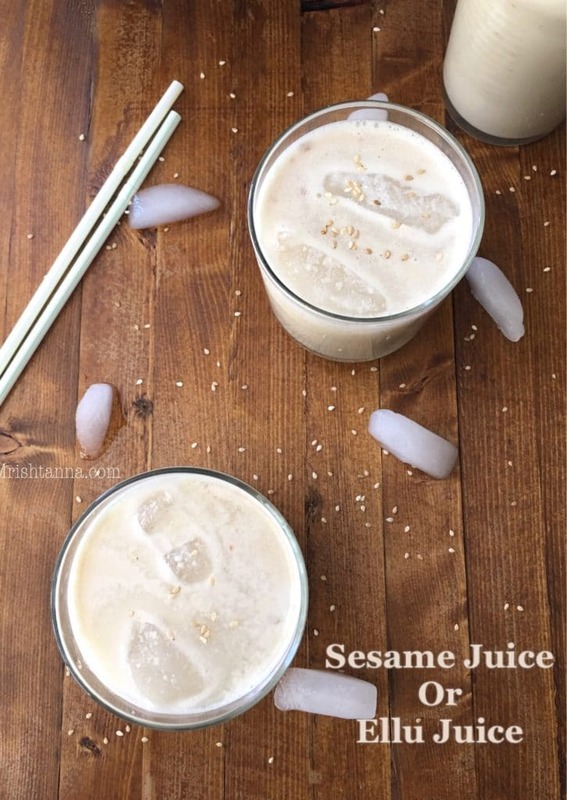 Sesame Juice is great Â for summer ! 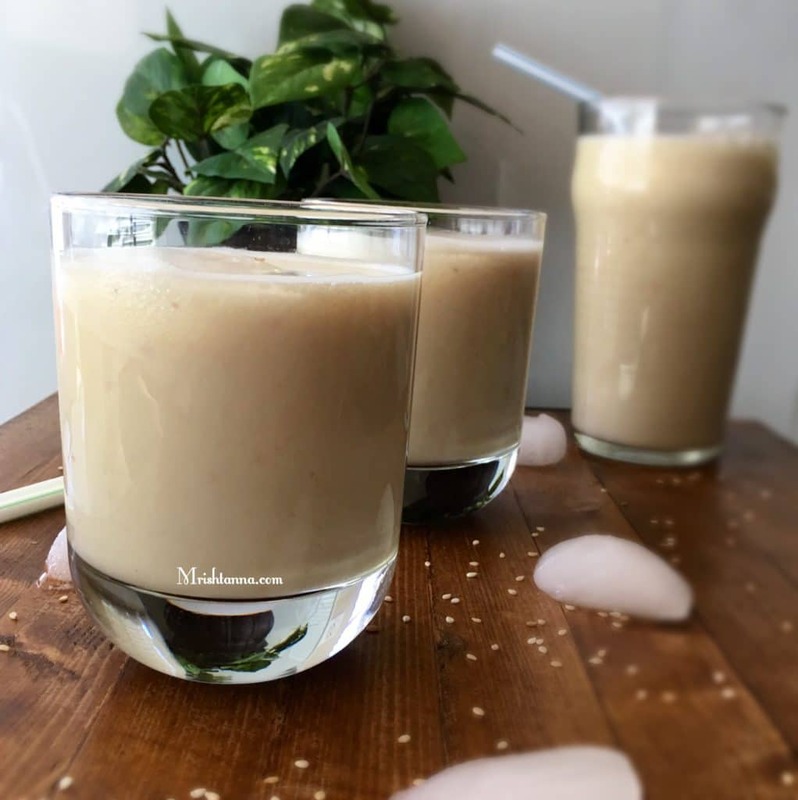 How to make authentic Sesame Juice? 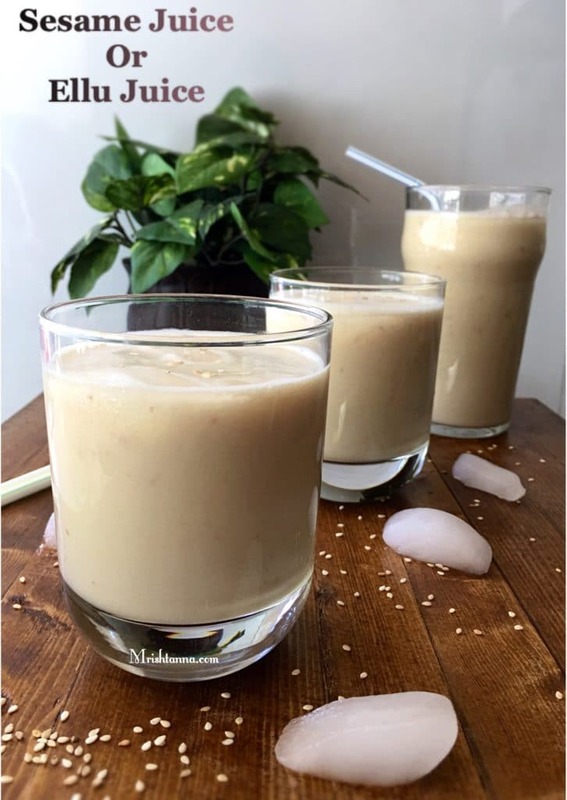 IfÂ youâ€™ve never had it or heard of it, Sesame juice or Ellu juiceÂ ( Ellu means Sesame In Kannada language) can best be described as a refreshing, creamy-ish, coconutty drink that is served chilled, pleasantly sweet and great for something to sip on in the summer heat. Think along the lines of aÂ coconutÂ milk withÂ cardamom. 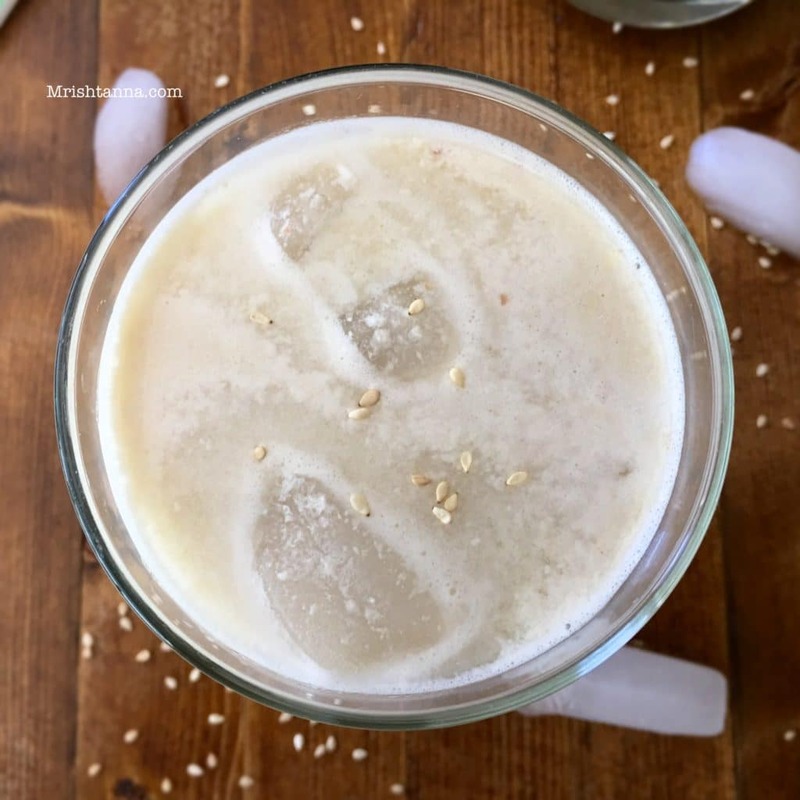 The beverage has an exotic history that traces back to ancient times, but more importantly for me, it is one of my childhood favorites.Â TheÂ nutritional benefits from Sesame makes it even more worthwhile for the summer time. Sesame can cool your body from within and reduce side-effects from spicy foods. Grab a glass of sesame juice right after a spicy meal and you will experience it yourself. As for what goes into the authentic drink, it is a measured mix of sesame, coconut, jaggery and cardamom. You could also try variations by mixing a handful of soaked (overnight) almonds or cashews as you prefer. Black sesame is another option but you will need lot more jaggery Â and coconut to neutralize the nutty flavor. Soaking the sesame is important to soften the seed and add to the creaminess.Â You will notice that I have used sesame for some of my recipes. CheckÂ out “Karnataka Cuisine” categories for more recipes using sesame. Soak the white sesame for 15 - 30 minutes. Rinse and drain the water. Grind the sesame and coconut with 1 1/2 cup of water to a coarse consistency. Blend the jaggery with 1/2 cup water and mix it with the sesame-coconut concentrate. You can use sugar, brown sugar instead of jaggery. But add as per your preference. Sesame juice is ready. Serve chilled with ice. PS: I will be on vacation for the next few weeks. I will miss connecting with you, but we can still stay in touch through myÂ facebookÂ page, twitter feed or Pinterest! 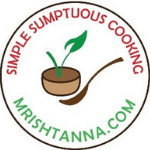 If you are looking for aÂ udupiÂ or vegetarian recipe, feel free to get in touch with me! Sesame milk! That is awesome! Yes it is 🙂 Thank you! I’ve never seen a recipe for this before. It sounds really good and so nutritious. This is totally new to me Uma. Sounds so nutritious and delicious. Will have to try it out some time. Pinned!! I’ve never heard of this but I can see why it would be refreshing on a hot day. I need to try this. I made this today at home and it is delicious!! Thanks for reminding this juice from my home town. I loved it. This is so interesting. I think I’m going to really like it, especially with the cardamom! I’ve never tasted sesame juice and didnt even know we could drink it like this. The combination looks good. I’d love to try this! It seems very exotic to me, but I bet it’s delicious!